"We can do more," Eric Lindros, the former Flyers captain, said over the phone recently. "To me, they're just protecting their interests,'' Keith Primeau, another Flyers captain, had said a day earlier. Last month, a 2015 deposition given by National Hockey League commissioner Gary Bettman was unsealed in a federal courthouse in St. Paul, Minn. It was the latest small battle won or lost in an ongoing lawsuit brought against the league by more than 150 of its former players. Linking chronic traumatic encephalopathy (CTE) and other cognitive problems to concussions suffered during their playing careers, the players are seeking damages from the NHL for what they argue was a negligent culture that not only allowed them to play after such head injuries but encouraged — and even pressured — them to do so. CTE is a degenerative brain disease. It's common in athletes, particularly football players and others who have suffered brain trauma, concussions, or repetitive blows to the head. That repetition leads to a buildup of tau protein, an abnormal protein that kills and eats away at brain cells. Once triggered, doctors say, the disease's progression continues even if no further trauma occurs. According to Boston University's CTE Center — the leading research institute in the field — symptoms can include memory loss, impaired judgment, confusion, anger, impulsive behavior, aggression, depression, and eventually dementia. But a diagnosis of CTE can be made only if the patient is deceased. Maintaining a position he and the NHL have taken since 10 former players filed a suit in 2013 seeking damages, Bettman argued in the unsealed deposition that the science is not yet there to support the link between each player's cognitive problems and injuries, detected or undetected, during their playing careers. This echoed several previous comments the commissioner made, although the league has denied all requests for interviews on the subject. An NHL spokesman said on Wednesday that the league could not comment because of the pending litigation. "From a medical science standpoint, there is no evidence yet that one necessarily leads to the other," Bettman said during last year's Stanley Cup playoffs. In an October 2016 letter to Congress, he repeated that defense, citing that "there are many gaps" in CTE research and assuring a House committee that "medical consultants for both the NHL and NHLPA [the players union] follow the research closely and have done so for many years." Said Bettman: "I know there are a lot of theories, but if you ask people who study it, they tell you there is no statistical correlation that can definitively make that conclusion." Commissioner Gary Bettman has maintained the position that there isn’t enough science to link CTE to injuries players suffer while playing in the NHL. He and the league are in the midst of a legal battle with a group of 150 former players who believe otherwise. Ann McKee, the neuropathologist who directs Boston University's CTE Center, has said a lack of donors is holding up a more definitive linkage. Last July, the center released a study that showed 177 of 202 deceased football players' brains had CTE. Of the 111 brains donated by NFL players, 110 had CTE. At the time, the center announced it had found CTE in 11 of the 16 brains donated by hockey players. All six brains from NHL players had CTE, but technically Bettman has a point: The link between hockey players and CTE needs more data. But he can't like the way it's trending. "If at some point the safety concern supersedes the financial one, then they'll do something about it,'' said Paul Edelstein, a personal-injury attorney who won a $22 million lawsuit against the State of New York in 2017 for the negligent treatment of his boxer client, Magomed Abdusalamov, following a 2013 fight. To players such as Lindros and Primeau, both of whom directly trace in- and post-career health problems to repeated concussions, the commissioner's position is confounding and callous. "It's insulting," said Primeau, who retired from hockey in 2006 at 34 after suffering the fourth of his documented concussions. The seven years that followed his retirement were rough, he said: "Head pressure, fatigue, exercise-induced lightheadedness and anger.'' A couple of years ago, an accidental bump into a door jam brought them all back. "I actually don't want to get caught up following it too much because I don't want to get mad," Primeau said of the current case against the NHL. "It's not that I don't care. It's that I care too much." So, too, does Lindros, who donated $5 million upon his retirement to fund concussion research. He has partnered with David Mulder, the team physician of the Montreal Canadiens, to petition the league to at least get involved with research seeking improved safety and better and quicker diagnosis of head trauma. "Concussions are going to happen," Lindros said. "You have a game of contact and high speeds out there. But what can we do to make sure that certain things are prevented. And if they do occur, how can we get people back to school, back to work, and in hockey skates back to the ice as quickly as possible. "It starts with basic research. Without basic research, we're putting Band-Aids on things. And reacting instead of being proactive. Before the all-star game in 2017, Lindros and Mulder presented a plan to the NHL in which each team would contribute $1 million toward concussion research. Lindros is particularly intrigued by ongoing work at Western University in Ontario. Researchers there have developed a blood test they said can immediately detect a concussion and the degree of its severity. Like the NFL, the NHL has developed its own protocol for determining immediately whether a player has suffered a concussion. It includes testing motor skills, cognitive response, and observation. But it's not fool-proof. A blood test would be, Canadian researchers said. "It's been very quiet ever since," Lindros said. 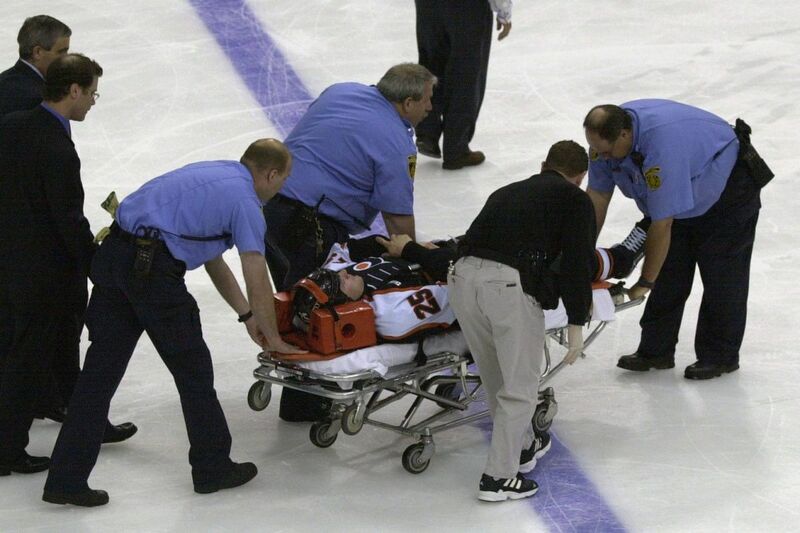 Eric Lindros’ career ended after a devastating concussion. Now, he’s calling out the NHL for not doing enough to prevent today’s players from suffering the same way he did. When he retired, he donated $5 million to fund concussion research. The league has been criticized when player deaths attributed to CTE are reported. Derek Boogaard, Bob Probert, Rick Rypien, and Wade Belak are players whose off-ice demeanor and habits changed radically after suffering injuries, leading to behavioral swings, drug addiction, and in some cases, suicide. And the NHL has reacted. Strict rules about concussion spotters, blows to the head, and the protocol for dealing with them are recent changes. But it's not difficult to understand why the NHL is reluctant to agree, like the NFL finally did during a congressional hearing in 2016, that concussions cause CTE. Because of that admission, the NFL is in the process of doling out at least $1 billion to settle a class-action suit brought about by former players. With its TV rights deals, advertising deals, and franchising deals, the NFL can afford it. It takes in an estimated $14 billion per year. The NHL isn't in that league. It's not even close. It earns an estimated $4.5 billion annually, so a settlement anywhere in the range of the one the NFL agreed to could cripple, if not extinguish, the league. It's also fair to say that there has been little public outcry from fans for the league to admit a correlation between CTE and head trauma. By and large, fans cheer the fights and big hits that crumple players. Some rue the rule changes that have reduced both. Bettman has said, "There is no "statistical correlation that can definitively make that conclusion" of a link between head trauma and CTE. It's a position similar to that taken by the NFL until March 2016, when Jeff Miller, the NFL's senior vice president for health and safety, was asked by Rep. Jan Schakowsky (D-Ill.) if the link between football and neurodegenerative diseases such as CTE has been established. "The answer to that question is certainly yes," Miller said, citing the work of McKee, the Boston University researcher. But McKee, and the work being done at BU's CTE Center, has found itself in the crosshairs of the NHL's aggressive defense of its position. In 2016, the league sought to subpoena documents of the roughly 400 brains and spinal cords of deceased athletes and non-athletes that have been donated and housed there. BU's attorneys argued it would be a prohibitively costly and cumbersome task, bringing research to a halt, siphoning money from that research, and violating the anonymity of families that have donated the brains of their deceased loved ones. It would also act as a deterrent to future donations, they said. Susan Nelson, the Minnesota federal judge overseeing the lawsuit against the NHL, agreed. She denied that request. The next step is her decision on whether the suit can broaden into class-action — binding all current and future suits to the decision ultimately made here. The NFL's billion- dollar settlement — and its eventual willingness to link concussions to CTE — came after it lost a similar class-action ruling. "Thirty years ago there were commercials marketing smoking as good for you,'' said Edelstein. "Now you'd be outraged, right? This is simply a battle between financial interests and moral ones. Fifteen, 20 years from now, we're going to ask, 'How did we let this happen?' "